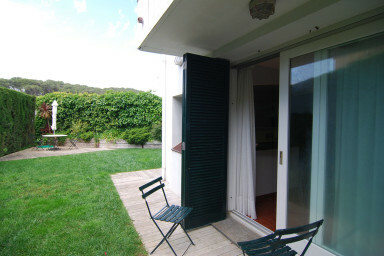 Wonderful apartment just 130 meters from the beach with fireplace! This apartment, just one street away from the beach, is ideal to enjoy meals out, and disconnect from big cities and noise. It's fully renewed, with quality furniture and a lot of storage place for longer stays. It's perfect for romantic getaways, as well as for parents with young kids, where they can play safely at the yard. This apartment has a very sunny garden for much of the day. It has a bedroom with a wardrobe of great ability and exterior window. The living room communicates with the garden through a sliding glass door. It has a convertible sofa bed if necessary (for kids and small people) and fireplace. The kitchen is semi integrated with the living room and is modern and bright. The bathroom has a bath, is spacious and functional. The apartment has gas heating. We recommend coming with a private way of transportation, as the public transportation is not fluid nor frequent. You won't find it difficult to park around town.